Saffron Tree is very dear to my heart. 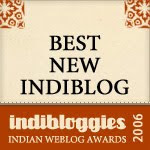 I discovered the site quite recently, about a year back, and it became my 'must visit' destination since then. It was love at first sight. Everyday in the morning, after my morning chores were done, and everyone out for school / work, etc., I would make myself a nice strong cup of tea, and sit at my laptop, eager to find out what Saffron Tree had to offer for that day. Having long been a book enthusiast, confirmed bookworm and mother to an equally book-mad daughter, I would look forward to finding new goodies here so that I could look for them at our library /bookstore. Here, I found the contributors to be after my own heart, passionately interested in the same kind of books that I was interested in, kindred spirits. And I found myself getting deeper and deeper into their world, adding my bit wherever I thought it was relevant. And one glorious day, something happened that was like a dream come true. I got an invite from Prabha Ram who planted this wonderful tree on 23rd October 2006, to join their wonderful team! Would I like to join them? Of course, I would! Since then there has been no looking back, and I have loved every bit of being part of the Saffron Tree team. That is my Saffron Tree story. Stories and more stories. That is what Saffron Tree is all about. And we shall be all of 4 on the 23rd of October, 2010. 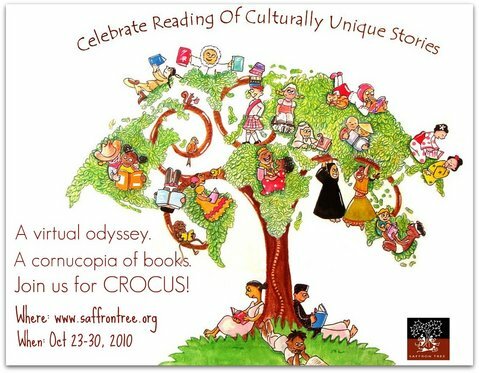 CROCUS, our festival, a week-long birthday party, is the perfect opportunity to have an explosion of stories, a many-flavoured feast for all our readers to gorge on. Encompassing different cultures all over the world. From all corners-East, West, North, South. From all times- ancient, medieval and contemporary. Of all kinds- about art, craft, music, dance, history, mythology, storytelling, differing lifestyles, food, religion, traditions and festivals. There's more- interviews with those who help create these stories- an illustrator, a storyteller, an editor, and authors. Something for everyone. A mouth-watering spread. Every day of the festival will have many such offerings, with interesting discussions in which all you readers are invited to participate and contribute. Games and party favours? We have an exciting CROCUSWORD to participate in, and prizes to be won. So dear readers, as the newest member of this wonderful team, I invite you all for our birthday party, and all guests are welcome. So do help spread the word about CROCUS, in whatever way you can. Waiting eagerly to see you all there! Wonderful. A really warm invite. Thanks for the warm and welcoming you-are-invited note, S! 23rd. Very excited about that! What a warm and beautiful invite, S! Especially with your personal Saffron Tree story - I could easily relate to it! A lovely invite Sandhya. Liked the personal touch. That reminds me, I also became a member of this loving family sometime after last year's CROCUS. About to complete one year here, feels wonderful. Thanks all! Waiting with all of you now, for the 23rd! yay! crocus is here! Cant wait for all the fun. Thats a beautiful image. Who designed it? Great job. It is nice to put a face on a name. Wish the ST team in Blore would meet up...I will host!! Yes I am back in Blore. Waiting for Crocus and this time I promise myself to keep up with the pace!! Awesome invite. Look forward to it! Thank you Nat! Hope you enjoy the festival. Thanks, B o o., Natrajan, ssstoryteller! It was great meeting you too, ssstoryteller! Quite unexpected!